Dan, KR4UB takes yet another photo with his cell phone and, having editor authority, posts it to the OCRA website within minutes. Pictured on the lower right corner is Joel, KM4NOU, OCRA Secretary and webmaster giving a presentation of recent capabilities he has recently added to the OCRA website. This includes the change to the website to make the section you are currently viewing, the home page. 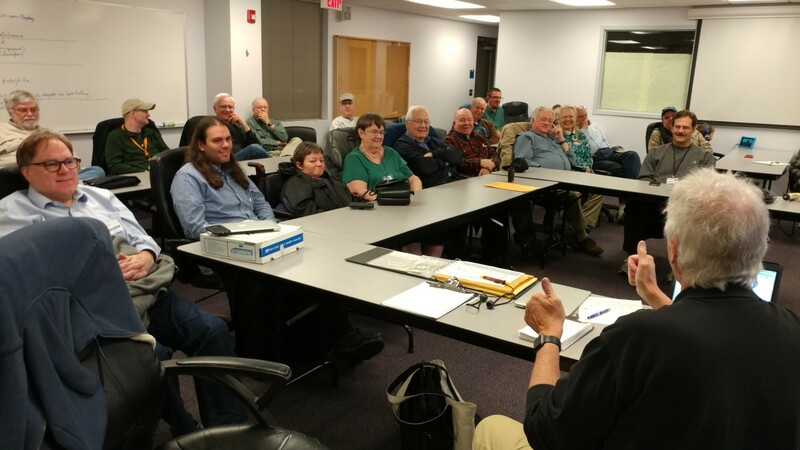 The intent is for the site to become the place where OCRA members can communicate on more of a real time basis, for example Dave W4SAR’s “presidents message” and frequent updates on 2017 Field Day planning. Members who would like to contribute articles of interest to the membership are encouraged to contact Joel the OCRA Club Secretary. The second part of the demo was of the membership listing page and how members can update their information, whether it be vanity call sign changes, contact information, ham radio interest areas, check their dues expiration date and as has been on the site for some time, the PayPal links for dues payment. Joel demonstrated how members can obtain their private access secure link to update their information. He also gave a glimpse of the back end that powers this capability, a site plug-in called “Participants Database”. This tool is very flexible and easy to adapt to however the club membership elects to use it in the future. Dan, KR4UB pointed out that the site uses SSL or Secure Sockets Layer that encrypts data to and from the user, whether it be from their computer, cellphone, tablet or notepad to the website. This is the same methodology used for financial transactions over the internet.